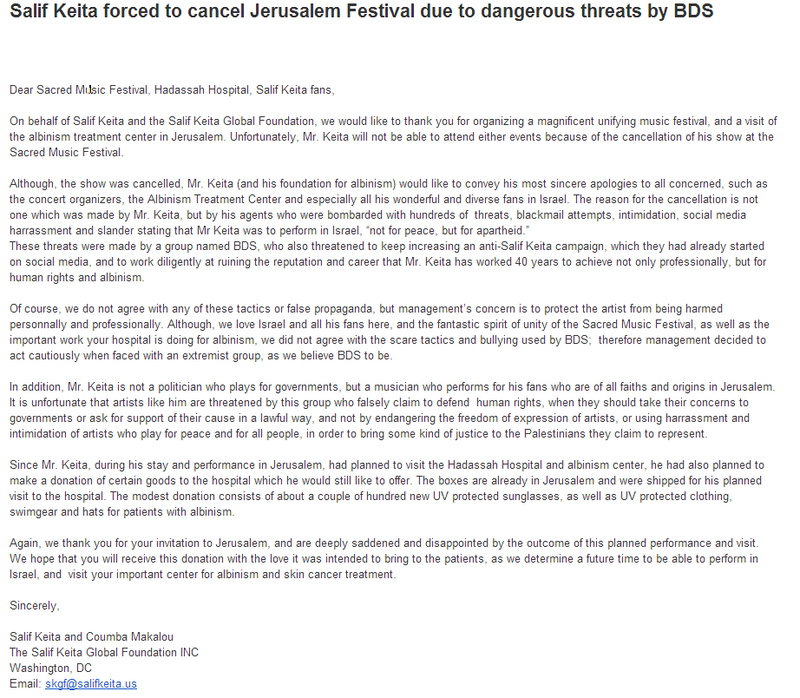 A few weeks ago I noticed that Salif Keita was due to perform at King David's citadel in the Old City of Jerusalem. I was both surprised and delighted. I was surprised because Salif Keita is from Mali, a predominantly Moslem country on the edge of the Sahara where there is both an Islamic insurgency and Al Qaeda presence. Keita was also once a minister in the government of Mali. Salif Keita is an albino, which apparently are a group who face discrimination in some parts of Africa and he works to prevent discrimination against albinos. I was delighted because Keita is one of my favorite African musicians. His music combines modernity with ancient African themes. I told my partner that while I would not be willing to spend 600 shekels (150 US dollars) to see the Rolling Stones or Paul McCartney (as they are today), I would be willing to spend that much to see Salif Keita in King David's citadel. The citadel is a structure just inside the Jaffa gate in Jerusalem which was built by King Herod about 2000 years ago. I have no problem with that, as I said I was surprised he would play here at all, and if he doesn't it won't affect how I vote or view the world. I just accept it as one of those things. What struck me was the debate on his Facebook page, which is rather sad. Some were saying the boycott was anti-Semitic, others that criticism of them as anti-Semite as an "attempt to silence debate". There was no attempt to reach out or promote peace and understanding. I saw that some supporters of boycotting Israel were comparing it to the bus boycott in Alabama and after reflecting on this I wanted to point out the difference between non-violence and boycotts as practised by Gandhi, Dr. Martin Luther King and the BDS movement. First both Dr King and Gandhi steadfastly and absolutely opposed the use of violence. This is not true of the BDS movement (boycott divestment and sanctions). Second boycotts as used by both Gandhi and Dr King were first and foremost actions taken by those on the recieving end of discrimination. One of the problematics of BDS is that it is not Palestinians who are using non-violence or boycotts, it is predominantly a European movement targetting Israel, while ignoring the history of European-Jewish interaction, in which boycotts were a means of persecution. Dr King always spoke out very clearly against anti-Semitism, even saying that "Israel's right to exist in security is incontestable" which the BDS doesn't. I suppose BDS supporters conflate themselves with the Palestinians and think that by acting in supprt they become part of a struggle they admire. Instead they are complicating the situation of the Palestinians and turning Israeli foreign policy into a struggle against anti-Semitism. The Palestinian's popularity in some respects is their achilles heal, preventing them from seeking or sustaining any peaceful resolution of the conflict. Incidentally a Rabbi, Abraham Heschel, was at the front of many of the civil rights marches. Right next to Dr King (second from the right in this picture).